As a homeowner, you understand that the protection your roof provides is important. However, because your roof is out of your line of sight during your daily activities, its condition may usually be out of mind. While many roof issues can be repaired by an experienced roofing contractor, your home’s roof won’t last forever. In fact, the average shingle roof lasts between 20 and 50 years, depending on the quality of the materials, so many homeowners find that their roof needs replacement before their mortgages are fully paid off. Replacing a failing roof promptly is essential to keeping your home warm and dry. In this blog, we list four of the most common signs that it’s time to consider replacement. Often, roof replacement becomes necessary due to extensive weathering. One of the most common types of weathering is cracking caused by wind and sun damage. If you notice a few cracked shingles, repair is probably still an option. However, if a third or more of your shingles have cracked or lost pieces, you may need to replace the entire roof. As shingles break, you may find small pieces or granules in your gutters. Large amounts of lost granules usually indicate the need for re-roofing. Cracking that appears over most or all of the roof also indicates the need for replacement. A small section of cracked shingles may have come from the impact of a tree branch or other debris and can usually be repaired without needing to replace the entire roof. Your roof shingles should lay flat against the sub-roof. This position ensures that precipitation runs off the roof and into the gutters as it should. When shingles begin to warp, this change may indicate water intrusion, heat damage, or excessive roof age. Warped shingles are more likely to break, blow off, or allow leaks into your home. Shingles can warp in several ways. Your shingles may cup, claw, or buckle. 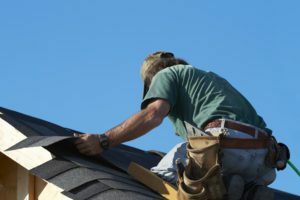 Roofers use the term “cupping” to describe shingles that have curled upward around the edges, creating an indentation in the center of the shingle. Clawing occurs when the middle of a shingle becomes raised, creating a pocket in the center while the edges remain flat. The term “buckling” describes a warping in a waved pattern that appears to travel up the roof. Moss and algae can look like a major problem on your roof. These types of organic growth can usually be removed and don’t necessitate replacement. However, the presence of excessive organic growth may indicate a drainage problem that can cause roof deterioration over time. In some cases, your roof could also become the home of toxic mold species that must be abated by a professional. By the time a roof begins leaking, it usually has needed significant repairs for some time. These leaks are sometimes overlooked because they may not start as a torrent of water coming from above. Watch for stained sections of ceiling, peeling ceiling paint, and new mildew growth. You can also check for holes in your attic space. Any hole big enough that you can see daylight through it indicates a major problem. These holes mean that there’s a problem in every layer of your roof and that the sub-roof, moisture barrier, flashing, and shingles may all require replacement. If you notice any combination of the warning signs listed above, begin planning to have a new roof installed to protect both your home’s interior and exterior. Is your roof showing irreversible signs of wear and tear? Have a reputable roofing contractor from Burke’s Roofing assess the damage, remove your old roof, and complete your roof replacement.